Progressive Charlestown: Why does Trump hate Puerto Rico so much? More than a million Americans on Puerto Rico are sliding toward starvation 18 months after thousands died there in the wake of Hurricane Maria. The federal disaster response overseen by President Donald Trump’s administration has been repeatedly criticized as a skinflint operation. Funding cuts imposed on the island this year have yielded horrific scenes, including an HIV clinic where patients are now being forced to wallow in their own waste for hours because staff cannot afford to buy enough diapers. But to the president, the story here is that everybody’s being unfair to him. “I’ve taken better care of Puerto Rico than any man ever,” Trump said Thursday afternoon when questioned about Gov. Ricardo Rosselló’s (D-PR) criticisms of the White House response. “Puerto Rico has been taken care of better by Donald Trump than by any living human being,” he said. The president appears to be plucking that number out of thin air, as the Washington Post explained when he used it in a meeting with Senate Republicans this week to grouse about disaster relief funding to the island territory. The federal disaster relief process in Puerto Rico is historic for quite different reasons than Trump’s imagined generosity. 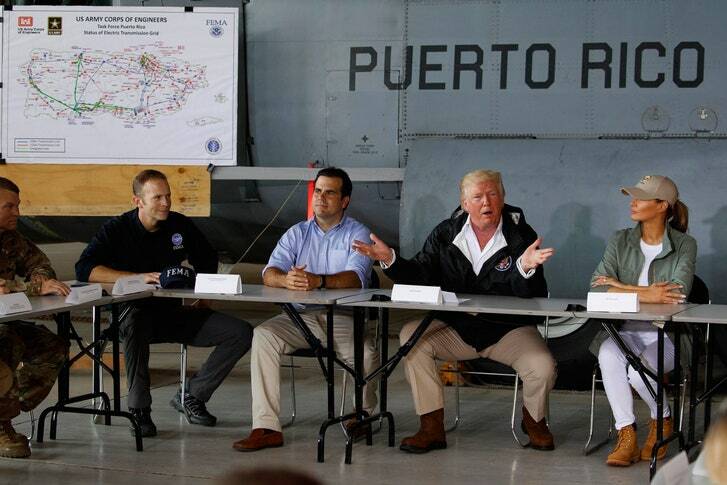 He may not be the first U.S. head of state to end up bickering with local leaders after their jurisdictions were destroyed by a natural disaster, but he’s the first to swap personal jibes with such representatives in public while the death toll is still rising. Rosselló’s pointed remarks toward Trump — including a suggestion that sometimes in life it’s valuable to “punch the bully in the mouth” during a CNN interview that aired earlier Thursday — are in part a direct response to the president’s reported rejection of any further funding to the island, which has been a U.S. territory for a century. Trump has also refused Rosselló’s request for a private meeting, used access to the island as a pawn in his shutdown theatrics, and sought to divert funds from disaster relief there to his wall-building quest on the U.S.-Mexico border. Since the storm, Rosselló and Mayor Carmen Yulín Cruz of San Juan have each run afoul of Trump’s notorious lifelong penchant for personal vendettas and reputation-based grudge-nursing. Rosselló has repeatedly noted that the slow, clumsy, and inadequate federal response to the catastrophic storm could have been much simpler and more effective if Puerto Rico were granted statehood. Puerto Rico’s peculiar relationship to the rest of its country is exacerbating the hardships that any populace would face while emerging from a storm as immense and violent as Maria. Because it is not a state, the basic food assistance program Puerto Rico residents rely upon is not automatically funded like the broader Supplemental Nutrition Assistance Program (SNAP) is elsewhere. The wrinkles Puerto Rico’s territorial status places in the funding distribution pipeline between D.C. and San Juan have forced cuts to food aid that could be restored with a relatively small distribution of new taxpayer money. Congressional leaders have reportedly agreed on a package to rescue the roughly two in five people there currently reliant on the program — and the only reason it hasn’t already happened is that Trump is vehemently opposed to the $600 million spend. The double game Trump is playing on Puerto Rico — indignant friendship posturing in front of cameras and ruthless pinch-purse score-settling away from them — illustrates the root problem the territory faces. Its citizens can enjoy their human and civil rights only as far as national leaders decide to allow. And without statehood, they don’t get any meaningful say in who those leaders are.